Have you ever taken a cooking class on your travels? As a way of learning about the local dishes and specialties, we take cooking classes as often as we can on our travels. 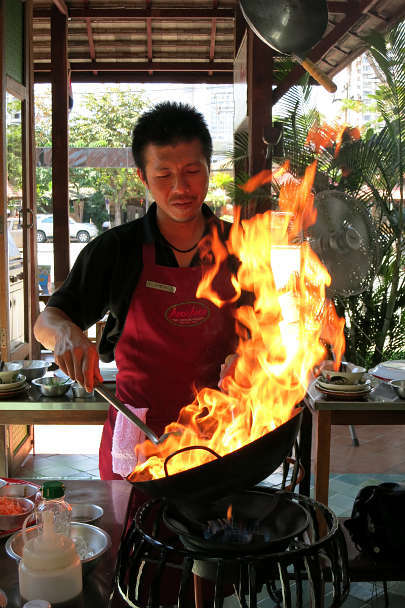 A Chiang Mai cooking class was high on our list when visiting this northern Thai city. 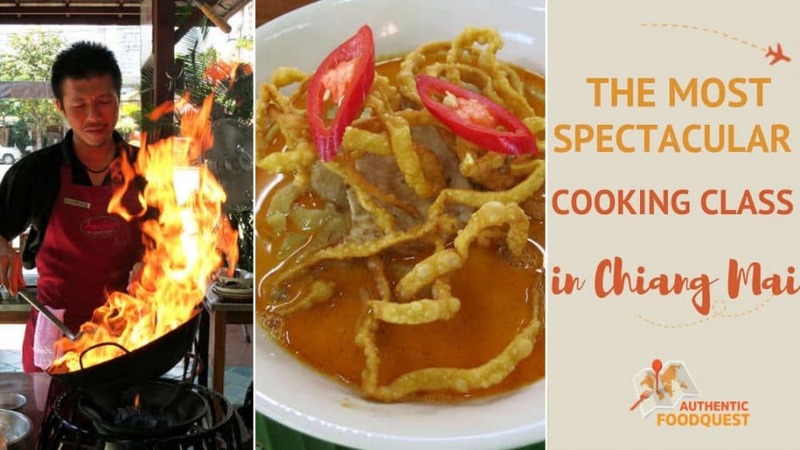 With Khao Soi, Pad Thai, and Mango sticky rice on the top 10 of our favorite Chiang Mai food and Thai specialties, we were eager to learn how to make them. 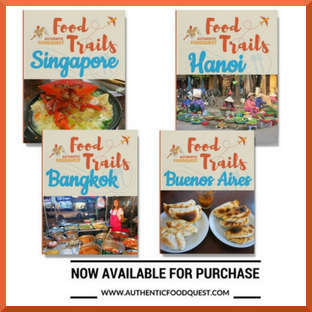 When we found Aroy Aroy Thai cooking school with a Warorot market tour, we were hooked. The opportunity to learn how to make these Thai classic dishes and visit Chiang Mai’s largest market, we quickly signed up for a class. 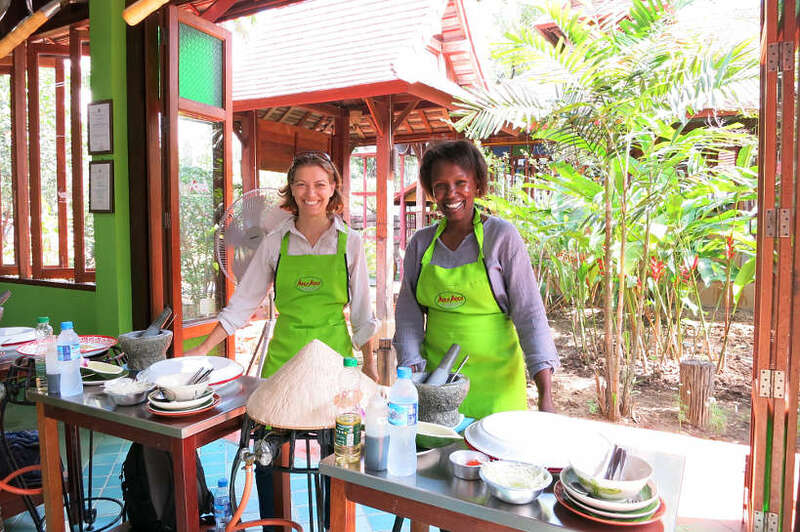 Join us for a spectacular cooking class in Chiang Mai. 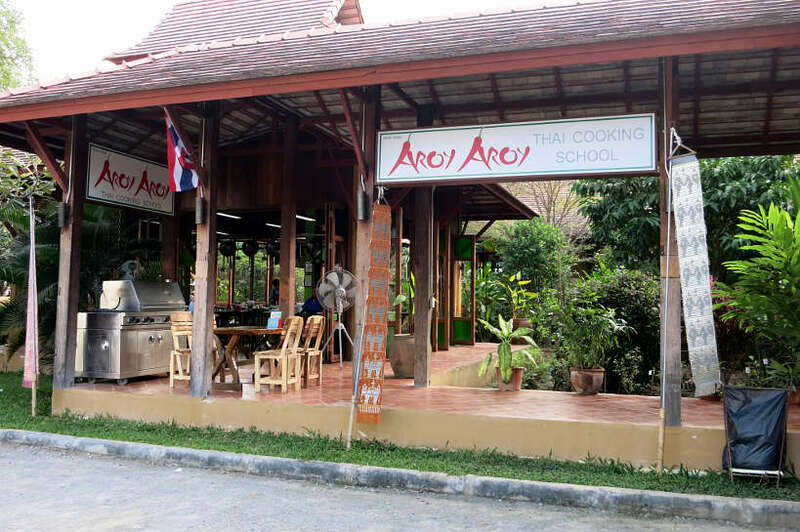 Aroy Aroy Thai cooking school offers authentic Thai cooking classes in an open and airy Lanna Style home. Using only the best quality ingredients including Thai herbs and vegetables grown in their own garden, you can count on a fun and delicious experience. As soon as we arrived, Roy the owner, greeted us with a large smile and refreshments. We learned that “Aroy” means delicious in Thai, which could not be more promising for the morning ahead of us. 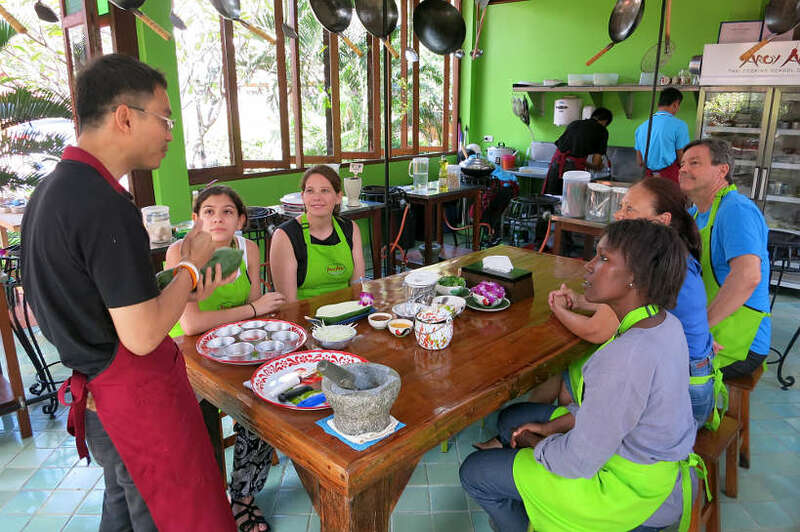 One couple and one mother and daughter team joined us for this intimate Chiang Mai cooking class. As soon as our group was ready, we were introduced to chef “A” and chef “O”, our cooking instructors for the day. 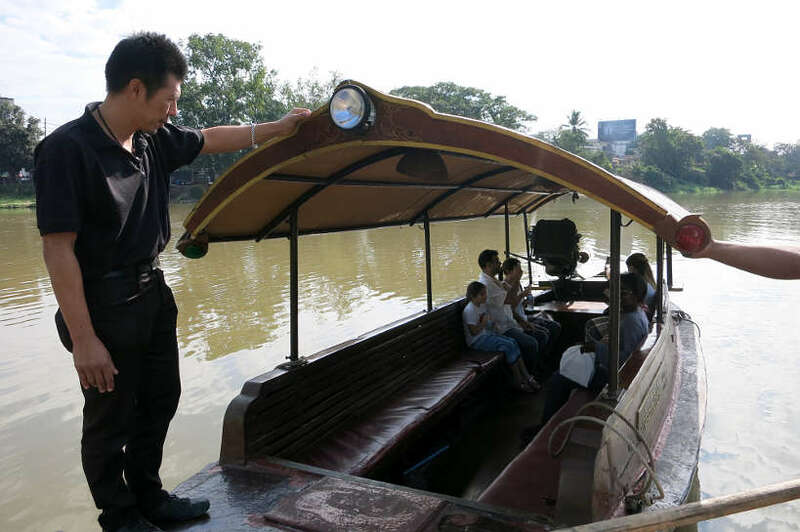 Before starting the class, we jumped onto a riverboat for a short cruise along the Ping river heading towards Warorot market in Chinatown. We were dropped off near Warorot market, one of the largest markets in Chiang Mai, in the core of Chinatown. 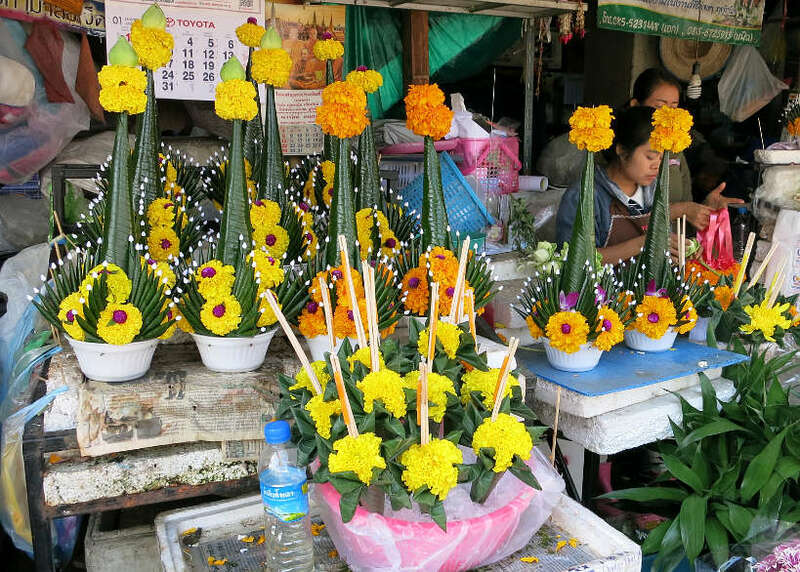 It was the eve of the Chinese New Year celebrations and we started out with a visit to the flower market, where beautiful flower decorations were being created. 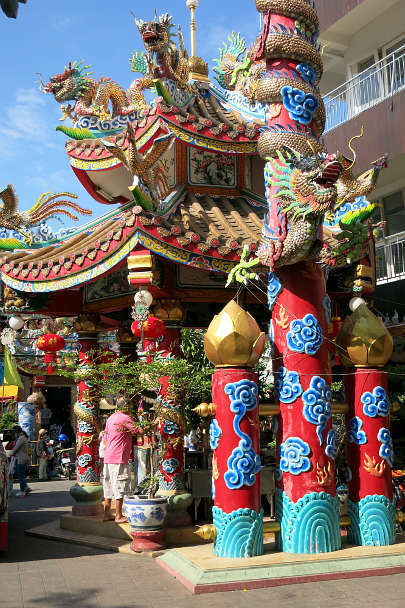 The visit through Chinatown continued to the Chinese Pung Thao Kong Shrine, one of the most important and sacred landmarks in Chiang Mai. We then made our way to Warorot market through the back alleys filled with street vendors. Chef “A” guided us through the market pointing out some of the popular stalls and vendors. 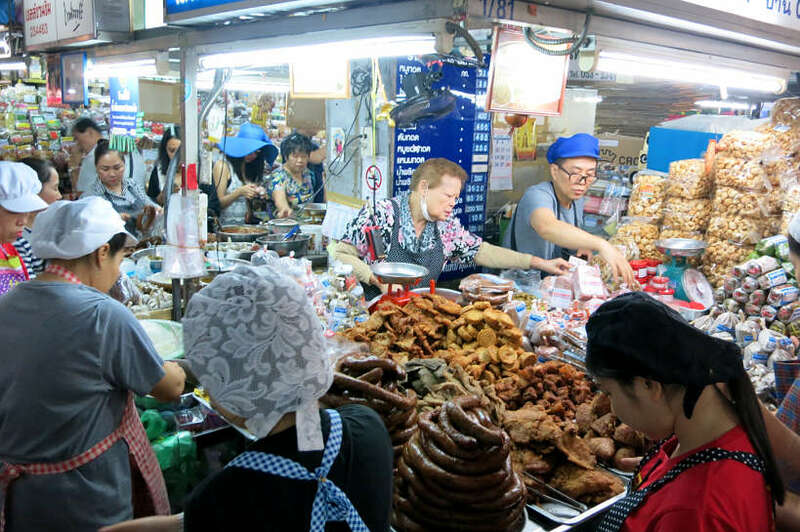 One stop was at the famous stall that sells sai oua, Chiang Mai’s northern style sausages. Walking through the vegetable stalls, we learned about some of the ingredients we were going to be cooking with, including green papaya and bitter gourd vegetables. One section we could not miss was the Thai desserts section. We were amazed by the range and variety of sweet treats, including the special Chinese New Year treats. 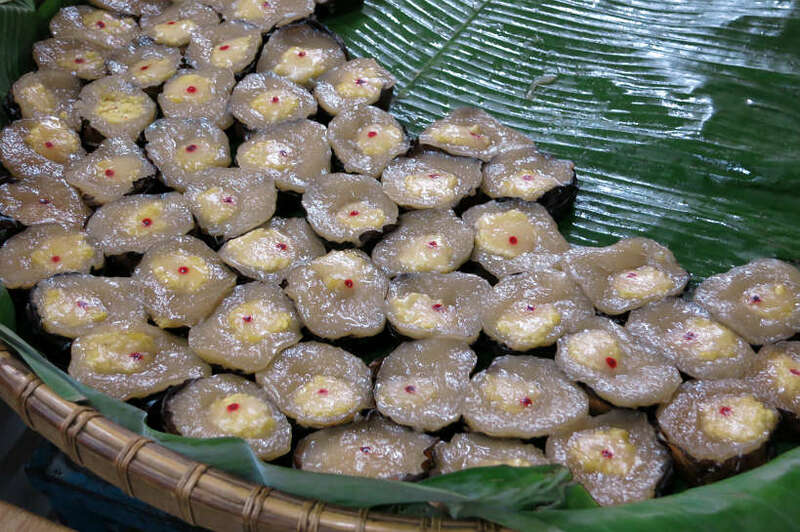 On display were different colored coconut rice cakes, called khanom keng, made special for the Chinese New Year celebration. Before heading out, we walked through the Wet Market where we learned about the Chinese New Year tradition of releasing frogs into the river for good fortune. After a short boat ride back, it was time to put on our aprons and start the cooking experience. For over 3 hours, we had fun learning how to cook traditional Thai dishes. We each had individual stations, equipped with a large wok. Our two chefs, – Chef “A” and Chef “O” would first demonstrate how to make each dish, and then we would each make them individually at our stations. All the ingredients were pre-measured and chopped for us ahead of time. In addition, we had the flexibility to adjust the spice levels using more or less chili and sugar. The chefs and the staff would walk around offering help and guidance, making sure no one was left behind. One thing that struck us as soon as we began cooking was the weight of the wok. We found it much heavier than expected. After that experience, we have a new appreciation for vendors cooking all day using a wok. The menu for the day, was the Chef’s Favorite Dishes, which was composed of 5 traditional Thai dishes. In this article, we highlight 4 of the 5 dishes. The cooking experience started with learning how to make Thailand’s most iconic salad. What looks complicated to make, is actually quite simple. The key is using a mortar and pestle. Essentially, all the ingredients are put in the mortar in a coordinated fashion. The trick is to gently pound everything with the pestle until the ingredients are bruised but not mushy. There is a rhythm in the process, gentle pounding followed by mixing with a spoon and pounding again. All this done harmoniously to bring forth the flavors and juices. When it was time to eat, what surprised us was that the chef made a point to ask us to decorate the dish. He told us that in the Thai culture, the presentation is important. 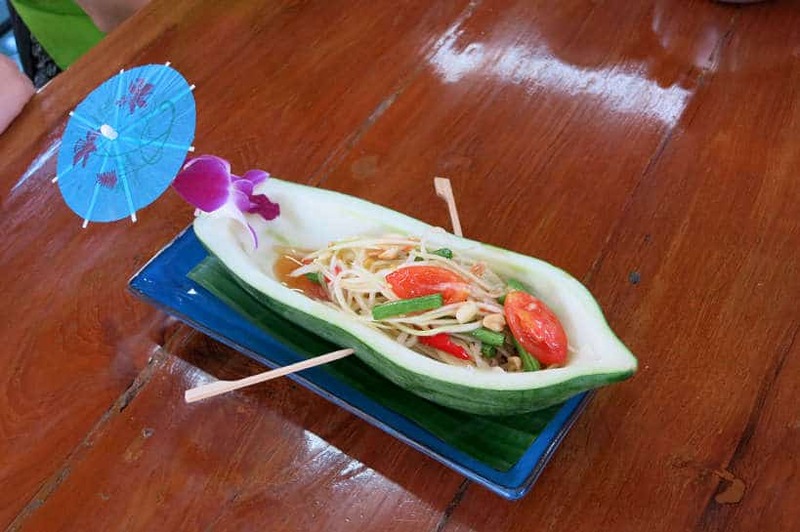 With that, we each personalized our half papaya shells and sat down to enjoy a delicious and beautiful salad. What was most fascinating about the preparation of the Pad Thai dish, was learning the history behind the dish. When you know a little more about the history of the dishes, you often find a new appreciation for the meal. 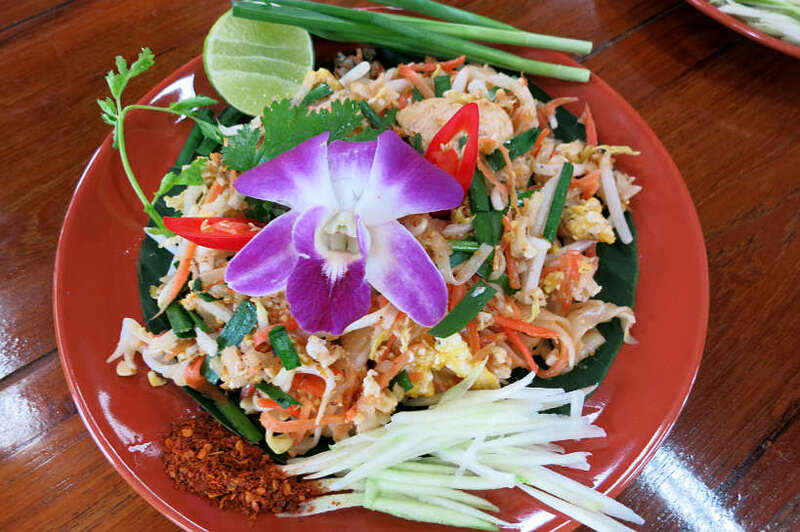 Pad Thai is one of the most recognizable Thai dishes. Outside of Thailand, you will find served with chicken, pork or beef. In Thailand, it is often eaten with shrimp, prawns, tofu and increasingly chicken. As chef “A “demonstrated how to make the pad thai, he also told us its surprising history. The dish was created by the Thai government about 85 years ago, as the country was going through political turmoil. The Prime Minister at the time was looking to build Thai nationalism and held a public competition to find a new national noodle dish. Rice noodles emerged as the winner and they were both cheap and filling. With the addition of vegetables, bean sprouts, and inexpensive protein, it was the perfect and nutritious meal for a county that was facing economically challenging times. The article The Non Thai Origins of Pad Thai, goes into much detail on what has become Thailand’s national dish. Regardless of the ingredients used, according to chef “A”, what makes a pad thai authentic is the use of pad thai sauce. The key ingredients in pad thai sauce are palm sugar, fish sauce and tamarind. The dish that we could not wait to learn to make was Khao Soi, the famous Chiang Mai noodle dish. In a few short days of arriving in Chiang Mai, Khao Soi quickly became one of our favorite northern Thai dishes. Khao Soi is a rich and spicy coconut milk based curry served with two types of noodles. Yellow egg noodles and topped with crispy noodles. The dish we learned from chef “A”, is typically served with chicken or beef and not pork due to its origins. 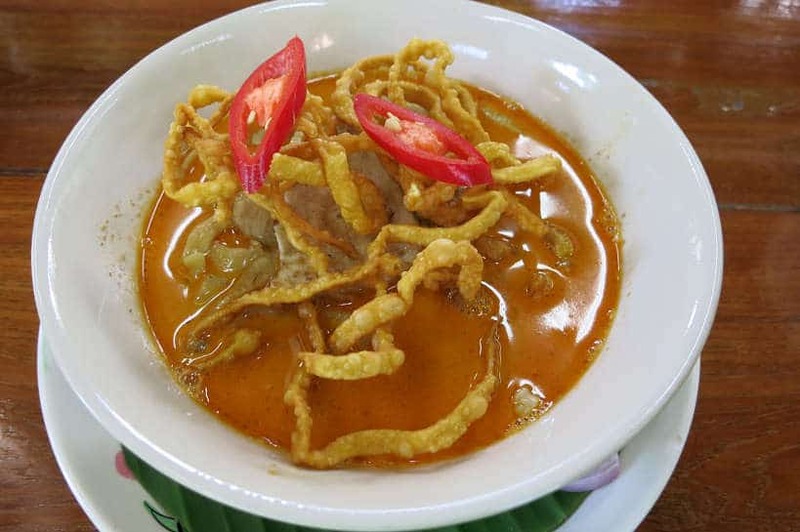 Khao Soi was brought to Chiang Mai by Chinese Yunnanese Muslims traders who do not eat pork. Accompanying Khao Soi, is a slice of a fresh lime wedge, shallots, pickled cabbage, and roasted chiles. What really surprised us about Khao soi was the taste. At the time of taking the class, we had already eaten Khao soi at several places and it tasted slightly different at each place. We learned that the secret to Khao Soi is in the sauce. The key ingredient is the red curry paste, which can be adjusted to suit one’s taste. As more or less red curry paste is added, it changes the taste of the curry. 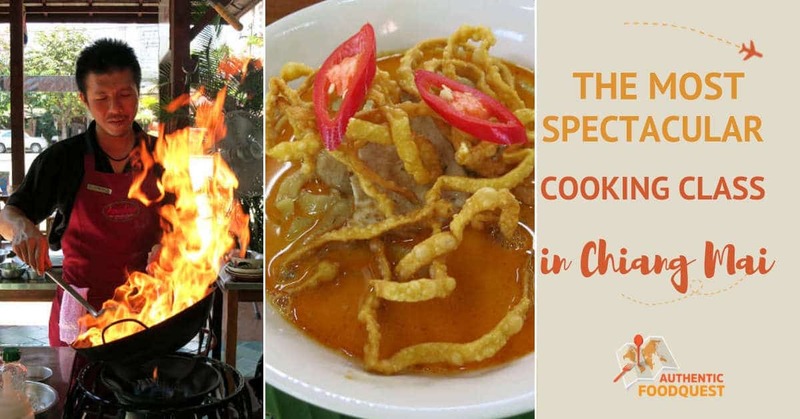 Read this article For more about Khao Soi in Chiang Mai, read our article fall in love with the best authentic Khao Soi in Chiang Mai. 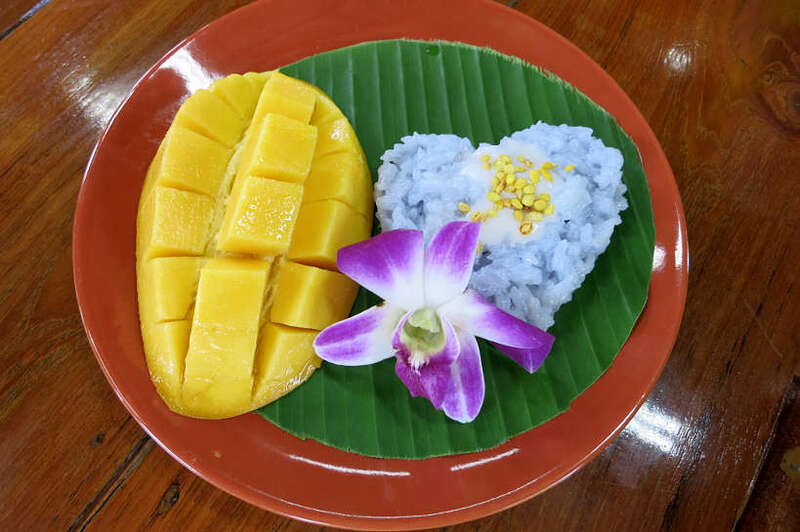 Mango sticky rice is a heavenly delicious Thai dessert sought after by visitors to Thailand. After indulging in many mouthwatering mango sticky rice desserts, we were wondering if we could learn to make it ourselves. We had read that it was not an easy task and that the sticky rice itself requires a couple of days to prepare. We could not have been more excited to find out that Aroy Aroy cooking class had mango sticky rice on the menu. The sticky rice itself takes more than 24 hours and as a result, we did make it in the class. Nonetheless, we did get an understanding of how to make it and the key ingredients needed. Chef “O” explained how it is best to let the glutinous rice soak overnight first. 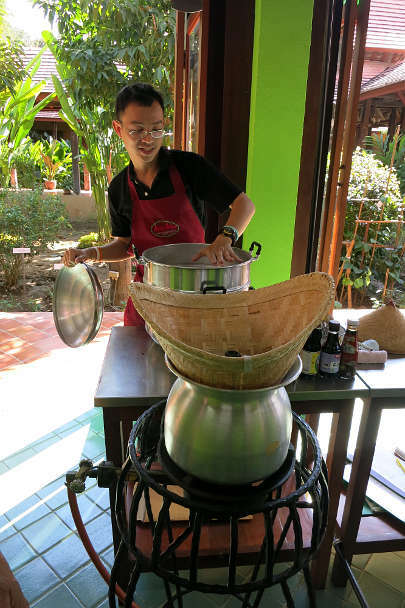 Then described the steaming process, the use of bamboo baskets and all that is needed to make sticky rice. As much as we love mango sticky rice, we are skeptical about our ability to reproduce this dessert back home. And so, we made a point of enjoying it as often as we could in Chiang Mai. Taking a cooking class while traveling is a wonderful way to immerse oneself in the local culture, learn about the local ingredients and indulge in delicious local food. Aroy Aroy Thai cooking school not only delivers on its delicious “aroy” promise, but also makes this journey fun and interesting. With free refreshments including coffee, beer, and soft drinks as well as time to savor your freshly cooked dishes, you are in for a treat. 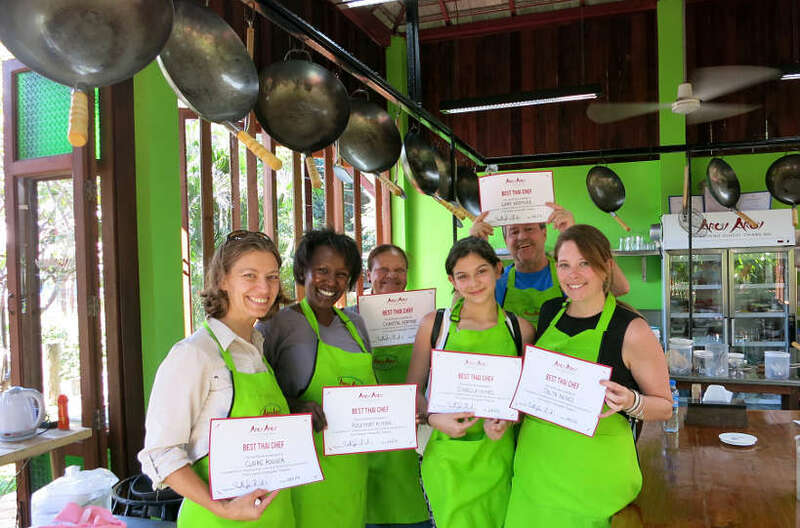 At this hands-on class, we got a certificate of completion, a digital copy of the recipes as well as tips on how to make these dishes back home. 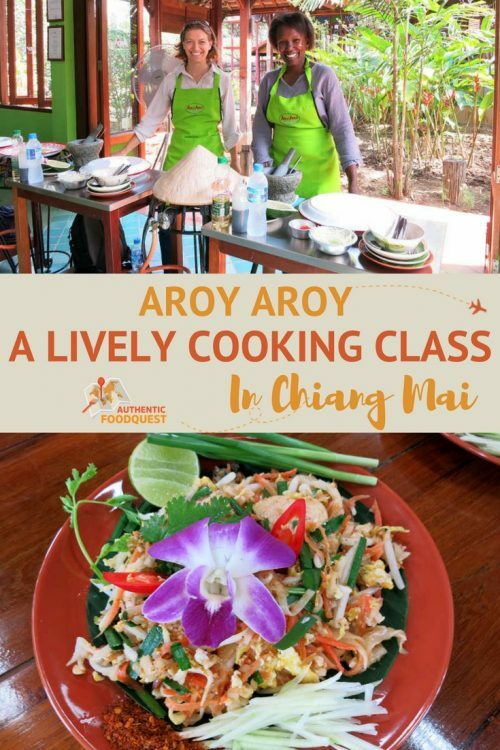 An Aroy Aroy Thai cooking class is an experience we recommend for anyone looking for a hands-on and authentic cooking class in Chiang Mai! UPDATE: As of June 2017, Aroy Aroy moved to a new location in Chiang Mai but they still offer the same authentic and amazing cooking experience. Details: The menu can be adapted for vegetarian, gluten or Halal with advance notice. Complimentary refreshments, a digital copy of the recipes and a certificate of completion at the end. Special thanks to Aroy Aroy for having us in this cooking class. All views and opinions expressed are our own. Full bellies and happy taste buds too. Looks pretty great! I’ve heard of this place, but always went to Chiang Mai Thai Cookery School. 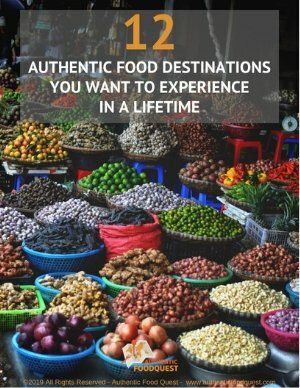 I agree with you that understanding the local cooking is also learning about culture and I think Thailand is easily one of the best places I have traveled to. Are they edible flowers? Yum–looks like you made some delicious food! I always love taking cooking class like this. It’s such a great way to get a look into the local culture, especially when you add a market tour on like you did. 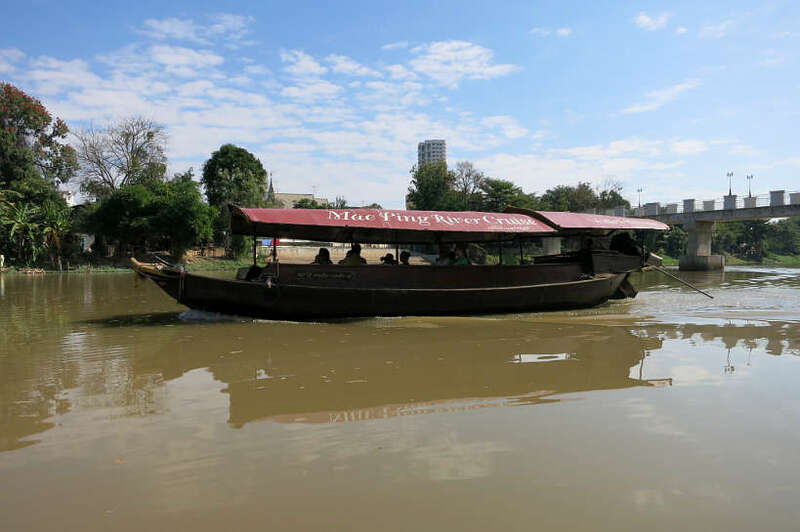 Aroy Aroy looks like a great place to book a tour–I’m definitely going to keep them in mind! Thanks Jenna and we totally agree, taking a cooking class and learning the local culture is always a good idea. True, we did indeed make delicious local specialties at Aroy Aroy. Do keep them in mind the next time you are Chiang Mai. A fun experience that is totally worth it 🙂 Please let us know if you have any questions!! Cooking class on a tour. That gave me some major goals. It is so good to learn to cook a cuisine, that way you can bring the country home and do your own little experiments and live the experience all over again! It is just so amazing. ha, lovely reading this, brings back memories 🙂 I’m very familiar with the khanom krok, but never heard of the khanom keng, is it similar? Looks delish! So glad you enjoyed the article and that it brought back delicious memories. Yes, the two are very similar and as you noted, both incredibly delicious! Gotta love Thai desserts. Thanks Amelie. Looks fabulous and I would love to do this. 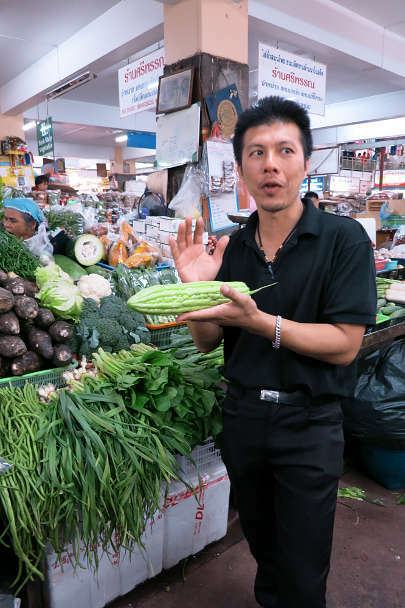 We did a food tour in Bangkok/Ayutthaya and the guide (who was a chef) took us to the markets to buy our lunch….so much fun and a way of experiencing the local way of eating . Your comment about the woks made me smile. I remember when I first saw them all lit up with flames coming out at all angles. Amazing. That’s awesome to hear Kerri and it sounds like you had a great time. Totally agree, learning to make the local dishes, does elevate any trip to a new level. Glad you caught the note about cooking with the wok, much heavier than we expected 🙂 Thanks for your comments and cooking classes should be on every travelers list of experiences! One of my biggest regrets from my Asia trip is that I didn’t do any cooking classes. I was going to do one in Chiang Mai but got too distracted with Songkran! Your pictures are stunning and it sounds like you really enjoyed it. I will def have to get myself back for a cooking class! That’s a bummer that you did not get a chance to take a cooking class in Chiang Mai. Completely understand as there is lots to do in Chiang Mai. The next time you are in the area, do check out Aroy Aroy…totally worth the experience!! Thanks Claire for stopping by. This looks like a great cooking school in Chiang Mai. The dishes look wonderful and the market trip sounds like fun. It was a lot of fun Rhonda. We didn’t have any expectations and we quite blown away by the entire experience. The market visit, the stories behind the dishes and of course making the food, allows one to travel deep. Do check out Aroy Aroy the next time your travels take you to Chiang Mai. Thanks Rhonda for your comments. Okay, this sounds like a dream to me. I am a chef so I’m obviously very passionate about food. I love how you can pick out your ingredients at the market beforehand. 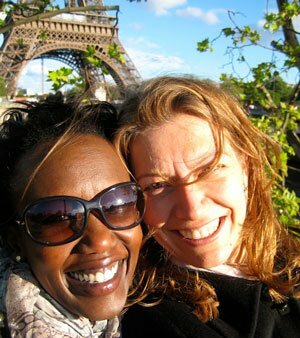 Cooking classes and food tours are such a great idea when traveling. Thanks for sharing! You’re very welcome Jenn! Great to hear your perspective as a chef. Yes, agree on the cooking classes, they make us much more active on our travels to seek out for the local specialties and how to make them! Looks fabulous This would have been a perfect day for you Guys! I am now living in Thailand, yes how lucky are we? I am looking forward to learning to cook Thai. I was interested in a comment from a new friend here who has been having Thai conversation classes – learning taxi and polite greeting Thai. She mentioned she also learnt how to ask for Pad Thai without sugar (I’m not sure whether that ruins it?) because there is an immense amount of sugar in local food here. I would never have guessed that, we all think we are eating so healthily! So cool to hear from you Wren. That’s exciting you are now in Thailand!!! 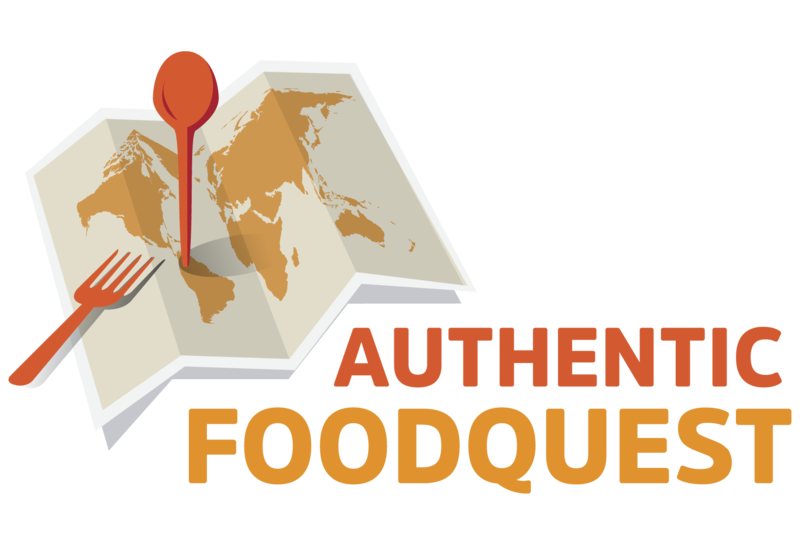 Sounds like you are already getting acclimatized to the food scene and the local ingredients. You are right, while sugar does play a part in the diet, it is balanced out with salt and spices. However, it is shocking to see locals adding heaps of sugar to their meals. Let’s connect!!! Omg! My mouth is drooling. The food looks really delicious! I can only imagine it up close and personal. This seems like a fun idea for someone like me who likes to experience culture outside of visiting museums and walking tours, etc. Thanks for sharing! It is our pleasure, Adriana to share our experience at Aroy Aroy. 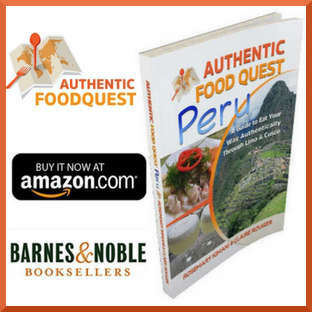 The idea is to inspire you to travel through local food. On your next trip, plan for a cooking class and you’ll be amazed at the different perspective it provides on the local culture and place. Do let us know about your experience. Cheers! Thai cuisine is one of the richest, in terms of flavour, in the World. Cooking class is definitely something to do there! That’s awesome to hear that you took a cooking class in Thailand. What did you learn to make? Agree, taking a class is truly a remarkable and fun experience. Thanks for sharing your experience 🙂 Cheers. 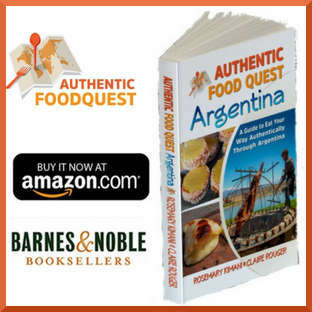 I love cooking and although I always try to visit local food markets (and bring some products home) I’ve never had cooking classes while traveling. Your post made me add it to my list! 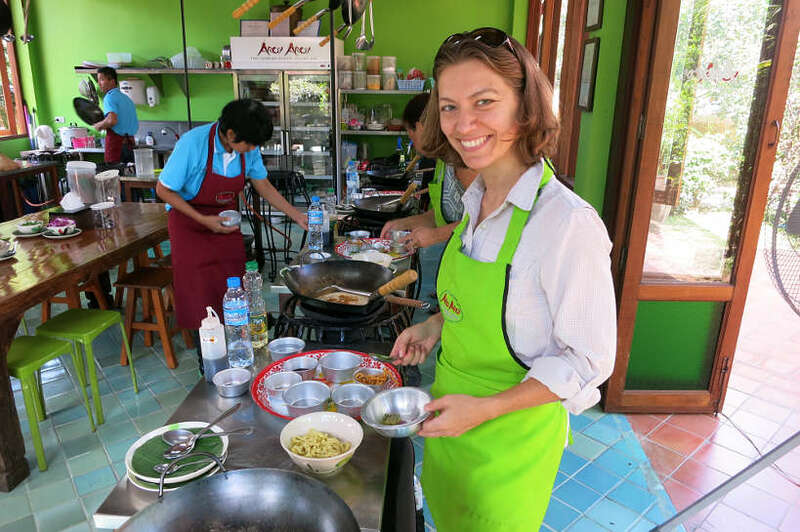 I only started doing cooking classes while travelling on my last trip in Central America & now I’m hooked – I want to revisit Asia all over again just to take cooking classes & Thailand is 1st on my hit list, Chiang Mai I am on the way soon! When you head out to Chiang Mai, definitively check out Aroy Aroy…you will be in for a fantastic experience!! Indeed, cooking classes do add a new dimension on the food on one’s travels. Thanks so much Sheena for your comments! Hi, I have a plan to stay at least a month in Thailand and my mission is to join a cooking class. I really want to travel, explore, and learn the culture. True that to enjoy the cultural immersion, cooking should be on the list. This is why I love to cook. Bookmarking this information about this cooking class. I am really excited.